Now here's something to put the fun into Friday, whether you have the day off for Easter or not. Someone had to do it, and so it's no surprise that someone like Ricky Gervais would spoof the Fifty Shades of Grey Curious? 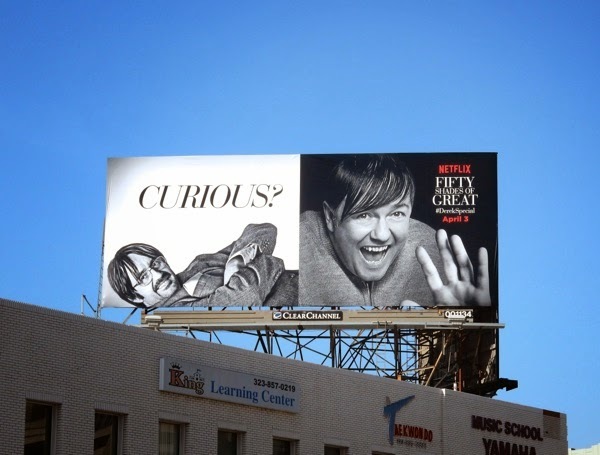 movie ad campaign with this 'Fifty Shades of Great' billboard for his Derek comedy series special on Netflix. In the same mockumentary style as his hit creation, The Office, the British funny man plays the naive retirement home caregiver 'Derek', which has earned the actor both Emmy and Golden Globe nominations. 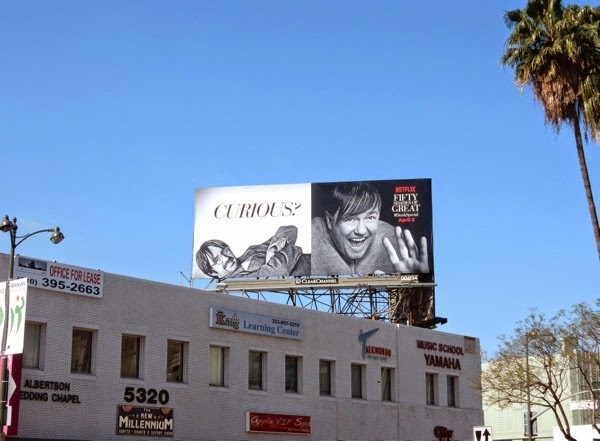 This hilarious parody billboard featuring the show's drunken disaster 'Kev' (David Earl) in the 'Anastasia Steele' role and Ricky Gervais as the titular Derek as 'Christian Grey' was spied along Wilshire Boulevard at La Brea Avenue on April 1, 2015. 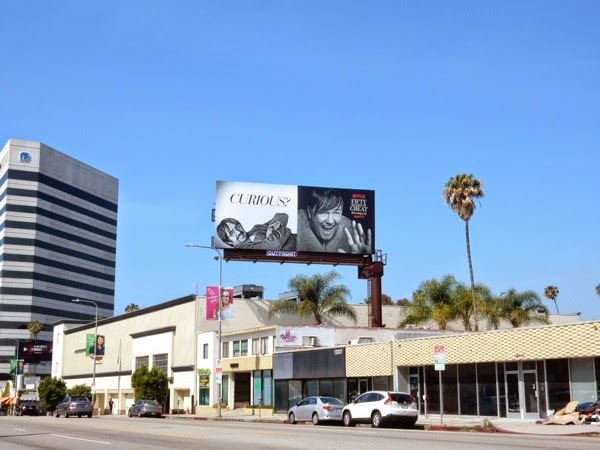 If you're a fan of the show, be sure to also check out these previous season billboards for Derek on Netflix in the U.S.
For another great film parody billboard, take a look at this My Little Pony Bridlemaids spoof of Bridesmaids. 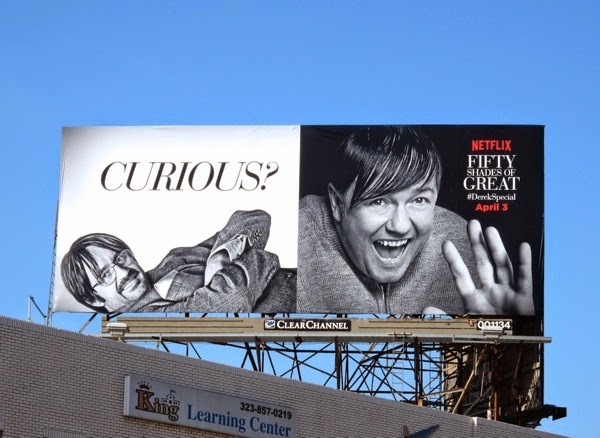 If you've never watched before, are you curious enough to take a look at Derek now? Wishing you all a very good Friday. 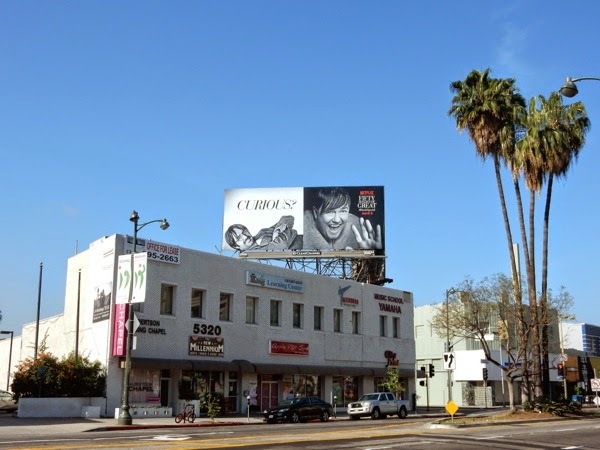 UPDATED: Here's another example of this hilarious billboard spied along Wilshire Boulevard in Brentwood on April 11, 2015. Oh, how it makes us chuckle and tickles our funny bone. 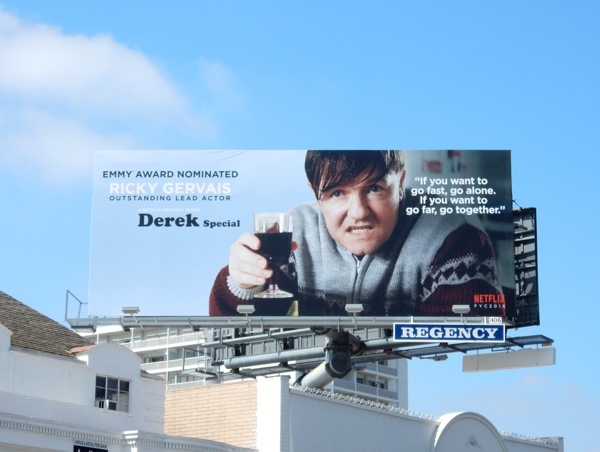 UPDATED: Obviously someone at the TV Academy likes Derek, as Ricky Gervais is up for another Outstanding Lead Actor nomination again this year. 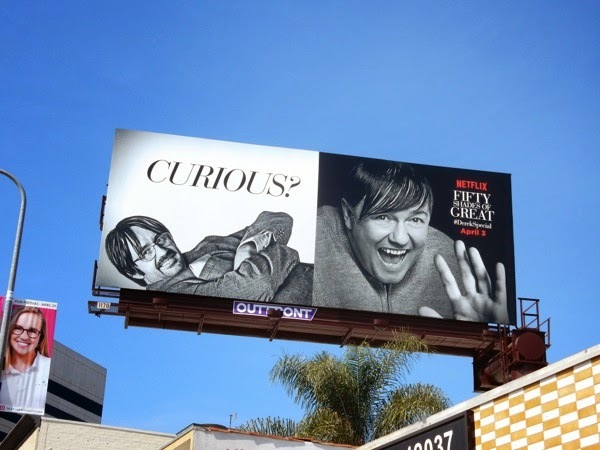 Here's the Netflix 2015 Emmy billboard for the Special spied along the Sunset Strip on August 11, 2015.